SoundStation2 is the ideal conference phone for small to midsize conference rooms that seat up to 10 participants. 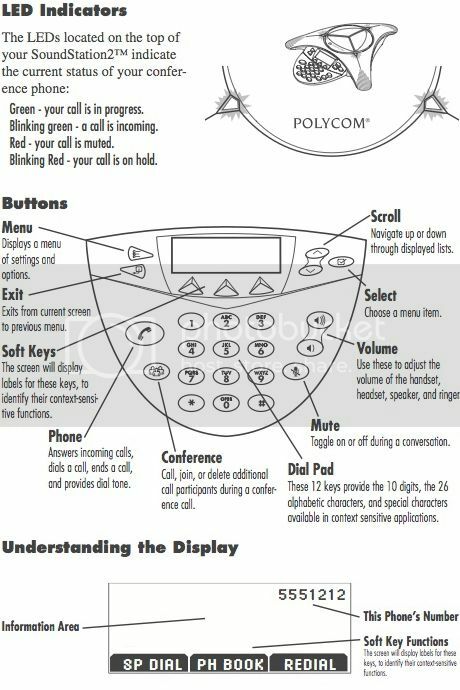 Polycom Acoustic ClarityTM technology delivers exceptional performance and voice quality, making your conference calls clearer and more productive. Industry-leading full duplex technology provides natural, simultaneous two-way conversation without clipping or drop-outs that are common in traditional speakerphones. Users can speak in a normal voice and be heard clearly up to ten feet away – making every call a more productive call. * Some features not available on all models – refer to chart on back for more details. SoundStation2 is part of a new family of tabletop conference phones that was introduced with the announcement of SoundStation2W™. SoundStation2 replaces the award-winning. SoundStation® and is ideally suited for medium/small conference rooms and offices. What is so special about SoundStation2 ? The SoundStation2 is Polycom's next generation conference phone and delivers remarkable voice quality equal to that of the SoundStation Premier®. SoundStation2 also provides a 50% increase in microphone pick up over the original SoundStation and adds great new features. A backlit LCD provides important call information and supports worldwide Caller ID. In addition, a 2.5 mm headset jack lets users connect to other communication devices. What does SoundStation2 have that SoundStation doesn't ? First and foremost, SoundStation2 delivers truly remarkable voice quality – equal to SoundStation Premier – along with 50% greater microphone pickup range than the SoundStation. With SoundStation2 you can speak naturally up to 10 feet away from a microphone and still be heard clearly. In addition, SoundStation2 uses the same industrial design as SoundStation2W, which includes a graphical backlit LCD that supports a number of new features, (i.e., display of call progress and duration information, worldwide Caller ID, 25 entry address book), and a new, more functional keypad with clearly marked mute keys and a conference service speed dial button. SoundStation2 also provides a 2.5 mm headset jack for connection to other communication devices. How does SoundStation2 connect to other communication devices ? SoundStation2 uses a cable that connects to a standard 2.5mm headset connector. If a communication device, such as a mobile phone, does not support this type of connection, an additional adapter is needed, which is not included with SoundStation2. Connecting the SoundStation2 to a mobile phone is similar to connecting a headset to a mobile phone. Not all mobile phone models will recognize the SoundStation2 as a headset. What is the maximum room size and maximum number of participants SoundStation2 can effectively handle ? SoundStation2 can handle a medium to small size rooms. What is the warranty for SoundStation2 ? Standard warranty is 12 months, with extended warranty options also available.